Back from suspension, Jughead is determined to uncover the truth behind what he believes to be Principal Stanger's plan to convert students into secret agents through his drone program, army-style training course and healthier lunch fare. The stringent code at school has led to more student suspensions raising concerns but Jughead's friends aren't ready to believe in his conspiracy theories without proof. 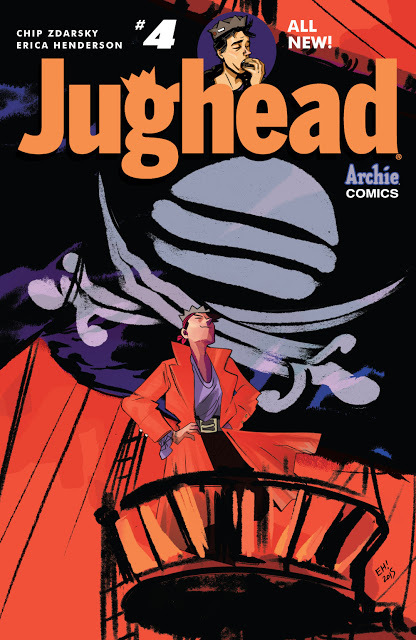 It's up to Jughead Captain Slackbeard (?) and Dilton to do some digging and get the evidence they need. The series has established itself as Jughead's playground, indulging in his wildest daydreams, which at first seemed like a cute gimmick but now makes more sense. It speaks to who he is and I if can remember far enough I did my share of daydreaming in high school too. These detours often inform his actions when he awakes but they've become extremely fun side stories that truly take you away. Here, he sees himself as a treasure hunting pirate mirroring his hunting of evidence against the principal. Another moment in the issue you'll probably here a lot about is how it addresses Jughead's sexuality. Archie Comics has gone to great lengths to diversify their characters for years. They've brought a more realistic spectrum of people into the wacky world of Riverdale. Representation means a lot to those who've been under served for ages. In this case, Jughead's discussion with a gay character leads to the matter-of-fact admission of his asexuality. It's brief and within the context of their conversation and not a big deal. Chip Zdarsky does a remarkably fluid job at the dialogue as he's done throughout the series. As usual Erica Henderson does wonderful work laying out this story. She opens with Jughead in silhouette as we see him from behind telling his friends about what he thinks is going on at school and each panel invokes motion while illustrating the dumbfounded looks on their faces. She's tasked to tell two stories essentially and they both look different and equally good. Her angular cartoon style is perfect for a character like Jughead. 'Jughead' #4 continues with the possible school conspiracy theme and adds a defining moment. The question is will Jughead's suspicions be vindicated or is it all a ruse? Regardless, it continues to be a fun subversive read that is smart and engaging.